Everyone's CRAAAAZY about magicstone making ever since the 1.7 update. So here's a guide on how to make them magicstones! You can learn the skill Make Magicstone and Decompose at Ascetic Fuhu. If you wish to start early and not wait until you reach Stone City, you can find him at Sand Village. 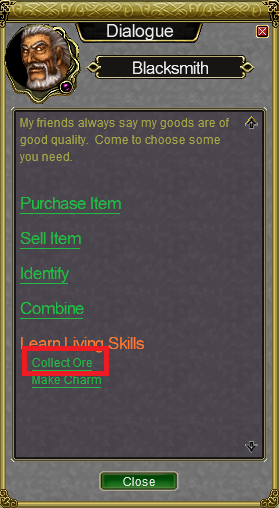 As for Collect Ore Living Skill, you can get them from any Blacksmith in the game; the earliest at Green Scarp. First Step to Making Magicstone! 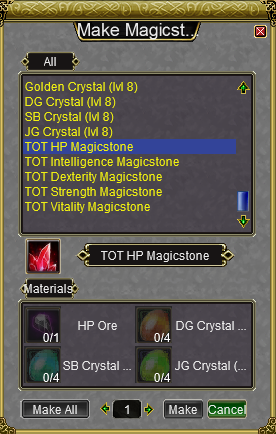 It is very important to have all the 3 living skills as a start to making magicstone as 2 out of 3 of the components required are obtained through Decompose and Collect Ore Skill. First, you have to get 2x Green Crystal (lvl 1). You can get by decomposing any green level 3-8 gear. You can decompose any gear, for example if you're an assassin, you can decompose wizard gear etc. 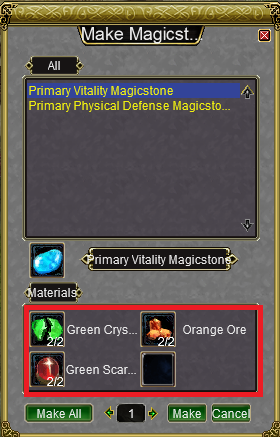 Second, you have to get 2x Orange Ore.
You can get by using Collect Ore skill at Green Scarp. You have to walk around to spot it because it is everywhere. Third, you have to get 2x Green Scarp Pill. You can get by killing mobs around Green Scarp. Once you have all 3 components, click on 'Make'. Do this until you reach level 3 in Make Magicstone. 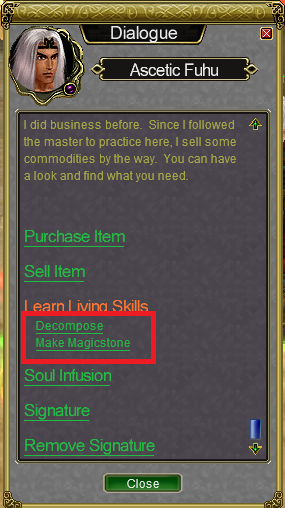 When you reach level 3 in Make Magistone, new options should be available. This is where Decompose Skill become very important. 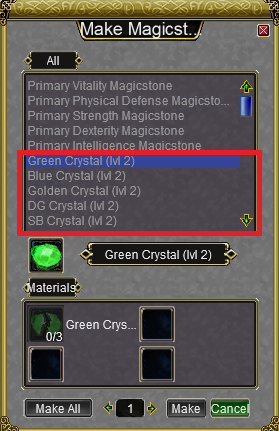 Take making Green Crystal (lvl 2) as an example. Decompose as many green level 3-8 gears you can find. When you have as many as you like, click on 'Make All'. Do this until you new Green Crystal making options. As your Decompose level and Make Magicstone level up, Decompose new gears and make other magicstone as you wish. Leveling up Make Magicstone is very tiring work and you must have patience to reach max level Make Magistone so you can make the sought after TOT HP Magicstone. I know you wrote a guide on Magicstone Making but, I don't see any harm in making another guide because our method of leveling up the skill aren't, loosely speaking, the same. Besides I don't see a rule about posting another thread on the same topic. always when there are SS that help alot, so thx for posting it with SS.